It’s Not Just A Map. You Get Much More. A Boston inset with a color-coded key of significant sites – along with a countdown to the Midnight Ride. Colonel Barrett’s inventory of exactly what military stores were concealed in Concord and in whose houses, barns, or sheds they were hidden. The houses at which Revere stopped and text boxes along the route. All in one convenient, high-quality 8 panel foldout format! 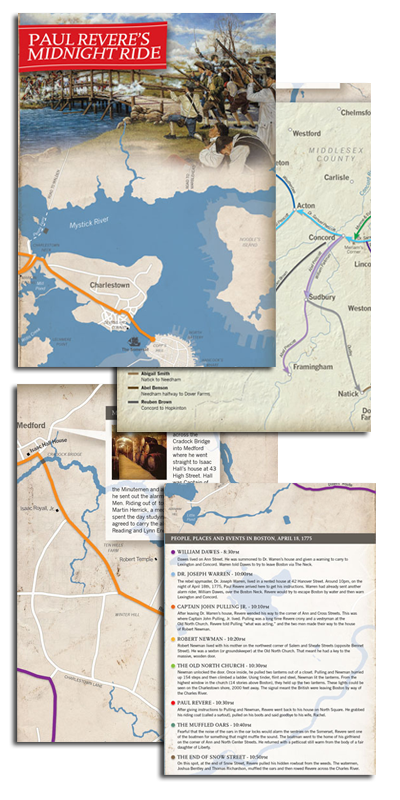 This map is packed with archival research and supplemental information – in fact, it’s the only stand-alone map sold at the Concord Museum!